Photo submitted and used by permission by Raji Muthukrishnan. Raji has taken a series of photos, generously contributing them for me to post on my blog to narrate the Varalakshmi Puja which happens on the third Friday of Aadi Month in Tamil/Telugu calendars in South India. This is a prayer celebration attended mainly for women, to pray to the goddess for health, wealth and general good fortune. Thamboolam. 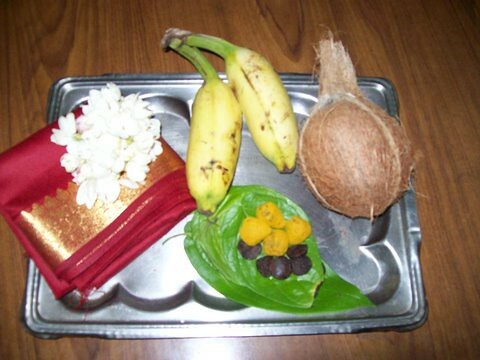 The thamboolam is a tray of gifts usually given to attendees before upon taking leave of an auspicious gathering like a wedding, holiday celebration, prayer celebration, holy day or others. This thamboolam was prepared for Varalakshmi Vratham. On the tray, you will see from top left around- a blouse piece, flowers for the hair, banana, coconut, and betel leaf with betel nuts on top. A blouse piece or some fabric piece is mandatory for thamboolam, and some families may adorn the corners with yellow powder- turmeric for good luck. Often these blouse pieces become 'recycled', though people may not readily admit they are regifting it. This happens because giving a fabric piece is considered a manditory token for thamboolam, and often a woman may or may not have a matching sari. She will not use it, and then what to do with it becomes a big question as it should not be thrown. The betel nut/leaf. For those not sure what to do with this- the betel is wrapped in a betel leaf and eaten as a mouth freshener and digestive aid. It has a strong taste for those not used to it, so bite in with caution. Also, this is not meant to be swallowed, though it can be. Some people add chewing tobacco to it, though for purposes of these 'party favors' it would not have tobacco. So discarding it (spitting it out) after chewing it for five or ten minutes is often a norm. while for Navarathri thamboolams I have given t-shirts for girls or hand towels for bathroom use. The thamboolam in American terms can be considered a party favor. Though all items are received by the guest on a silver platter, the guest should not actually take the platter. The guest would pick up everything on the platter with the right hand. Then the hostess most likely will give a small plastic bag or jute bag to place it in. Before putting it into the bag, one usually has piled everything into right hand, put left hand under right, and lift all items up to eyes and thank god for it, like a blessing. Raji has written about thamboolams, the art of thamboolams and associated thoughts on her post Samplings of Thamboolam. Thank you very much, Raji for sharing these wonderful photos!